Linda Burton posting from Raleigh, North Carolina – If I were a squirrel, I’d move to Raleigh to raise my family, and live out my retirement days. 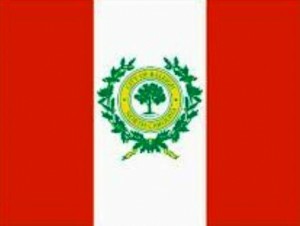 Raleigh, you see, is rich with oak trees, so much so that its nickname is the “City of Oaks.” Oak trees are everywhere you look; white oaks are native trees; red oaks too, happy in the Piedmont clime and soil; they graced the land when settlers came; they shade the parks and line the streets today. The Seal of Raleigh has an oak tree center spot; the same thing on the city flag. 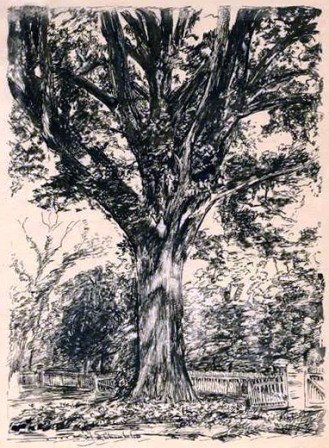 Oakwood is the city’s oldest neighborhood; oak trees have witnessed history, and known their share of fame, such as the Henry Clay Oak, which stood near North Street and Blount; he wrote the Raleigh Letter while sitting underneath in 1844 (he argued against the annexation of Texas and later lost the presidential nomination to James K Polk; he commented then “I would rather be right than president.”). In 2007 the City Council put restrictions and guidelines in place to protect the city’s trees, recognizing that “Raleigh is blessed with a diverse and abundant cover of trees and vegetation and…such cover is of general aesthetic value to the City and…the ecological diversity and richness of the City makes it a desirable place for residents, owners, and visitors alike….” Valuable assets for residents, owners, visitors, and squirrels, I say. 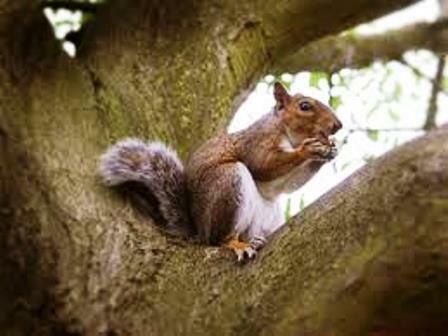 Have you ever watched a squirrel cavorting in a tree? They jump and sail high above the ground; oak tree branches make good highway routes for squirrels, and up against the trunk, great nesting spots. Oak trees are sturdy and generally grow to 80 feet tall; oftentimes they are equally as wide. Oak trees live 200 years, if conditions are right and nobody chops them down in their prime; the oldest known has a thousand birthday rings. Oak trees reproduce themselves by means of a seed in a tasty pod we call an acorn, and, are you ready for this – one healthy tree can produce somewhere between 70,000 and 150,000 acorns a year. 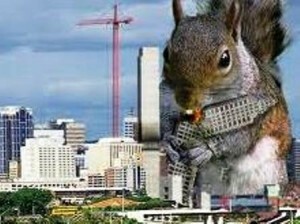 In the opinion of a squirrel, that’s a five-star eatery! 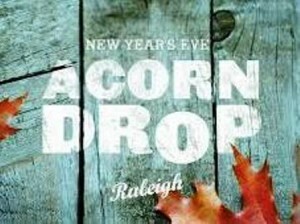 But oak trees and acorns are people pleasers too, and folks in Raleigh love them in unique and clever ways. Such as – the Cree Shimmer Wall. On the back side of the Raleigh Convention Center is the most unique piece of art I’ve ever seen. 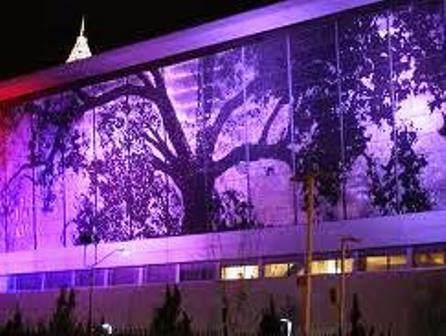 The image of an oak tree covers the back wall of the building – that is, 9,284 square feet – and yes, it shimmers. 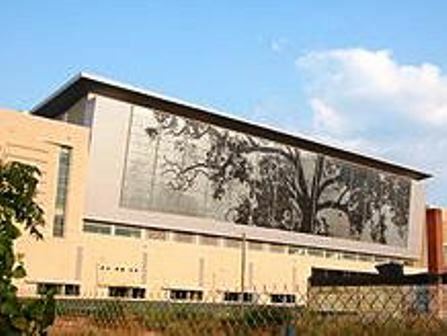 It is made of 79,464 light and dark aluminum squares that make the image appear to move as they flutter in the wind. “It’s a low-tech thing,” says Thomas Sayre, with the Raleigh architecture firm Clearscapes, that created the piece, “it’s just the movement of the wind.” A breeze makes the tree come alive; a fabulous concept and a beautiful sight. Even more entrancing is the night-time look of it; it is backlit by 56 light-emitting diodes that can be programmed to flash and display more than a million different colors. 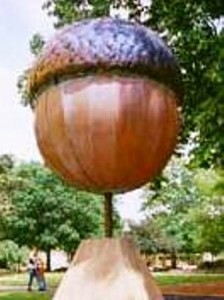 Another piece of public art that celebrates the oak is lovingly called The Big Nut – a giant acorn mounted on a pedestal in downtown Moore Square. The 10-foot-tall copper and steel sculpture weighs 1,250 pounds; John Watkins thought of it and raised the funds; sculptor David Benson created it for the city’s bicentennial in 1992. Is it the biggest acorn in the world? It certainly is the most fun; it’s the backdrop for ordinary Sunday strolls in the park and for events and festivities such as the pre-St Paddies Day celebration tomorrow, but it takes center stage on New Year’s Eve. That’s when it is carefully removed from its pedestal, hoisted skyward by a crane, and dropped at midnight, just as the famous apple in New York’s Times Square. It’s a part of “First Night Raleigh,” a family-friendly event that’s been going on for more than 20 years. I read that downtown was decked out like a carnival last December 31 – a giant Ferris wheel, the Jumbo Drop, and acrobatic performers from Cirque de Vol. The Children’s Celebration began at 2 PM; Tots Under the Big Top was one event in the Nature Research Center. The People’s Procession started at 6 (anybody could be in it who wanted to be, along with the Giant Puppets) and the children got to see the acorn’s early drop at 7, complete with fireworks just for them. Late-night revelers partied till the midnight hour, and watched it drop again; next day, it was carefully restored to its mounting in the park. The squirrels, I’m betting, watched, with ideas of their own on how to celebrate.